Which drum kit should I buy? So I’ve been looking to update my drum kit recently. I’ve been playing an old Yamaha drum kit that I’ve had for about 15 years and smashed the bejesus out of it. The skins all need replacing and it gets harder and harder to tune up the toms each time I play. As I’ve come into a bit of money recently I think it’s time to feed my music addiction and buy myself a new rhythm machine. I’ve been looking online at drum kits for sale and have been pretty overwhelmed with the available choice. From Pearl to Gretsch and all the drum manufacturers in between there are some beautiful kits to choose from. So in this blog I’m going to share the possibilities and my thoughts about which one is going to suit me the best! Drummers by their nature are extremely tribal. Some drummers will only buy one brand of drums their whole life, or even get unreasoned loyalty to a particular cymbal or cowbell. Luckily drums are pretty robust so as long as you get a good set it’s going to be with you for a really long time. Given the longevity of kits and tribal loyalties it’s important to get the right set of drums from the start. A good way to begin is to pick the right brand - good drum manufacturers are a guarantee of a certain level of quality. Let’s look at some of the best brands on the market today. Pearl are one of the most respected manufacturers in the world. They have drum kits at all budget levels and they are quality all the way down to the cheaper models. Famous artists who play pearl kits include Mike Alonso from Electric Six and Michael Barker from the John Butler Trio. Perhaps initially more famous at the budget end of the market, Yamaha are now long established in the drum world and are producing some good high-end kits in addition to the great value for money budget sets that had been their forte. Ludwig are an American manufacturer whose most famous son is definitely Ringo Starr. Throughout the Sixties at the height of the Beatles fame, he was smashing a Ludwig kit in his unique, almost melodic style of play. 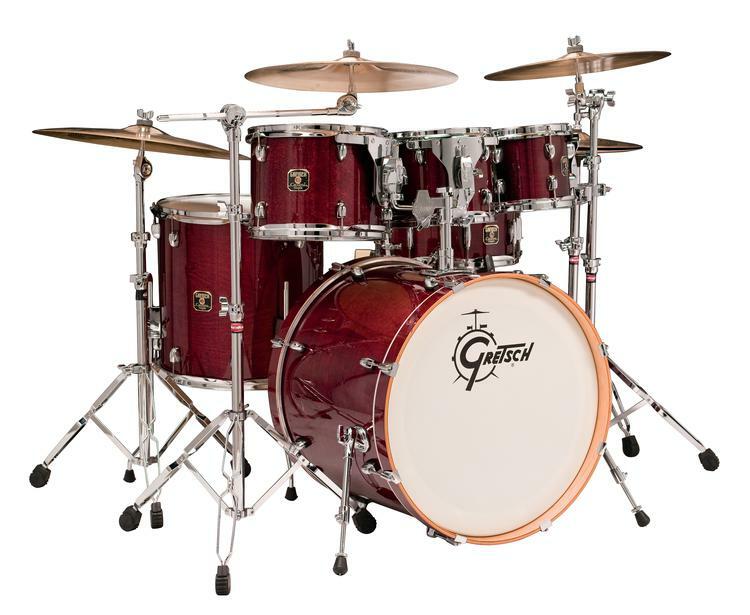 Known for beautiful, jazzy electric guitars, Gretsch also make a mean drum set. Another American company, their drums achieved the highest popularity in the Eighties with Phil Collins and his hugely gated and reverbed sound. Those drums have been sampled and reused on massive rap and RnB tracks of today. Though they don’t make full kits, Zildijian are arguably the most respected cymbal manufacturers in the world. The crisp sound and incredibly accurate tuning of their cymbals makes the list of famous user way too long to write on this blog. It’s worth saying that spending as much money as you can afford is a good thing. It’s a cliché but in the drum world you really do pay for what you can get. Though you do pay a certain premium for known brands, they are not only sure to be good but also hold their value a lot more should you ever come to resell the kit. The Pearl Export Series drum kitmade Music Radar’s list of best kits to buy - http://www.musicradar.com/tuition/drums/the-best-drum-kits-in-the-world-today-218020. It’s a superb instrument and I really got lost in the music when I was hitting the skins with this beauty. The build quality is excellent and I really liked the sound of the toms. I got the snare sounding really tight too. My only slight criticism is that it maybe sounded a bit slick for my tastes, but with time the kit will play in, the wood will expand and resonate more and the sound will get a bit ‘older’. It’s the same with all new instruments. As a huge Beatles fan, I’m a sucker for a Gretsch and the Gretsch catalina maple drum is definitely one that spoke to me. Also on the Music Radar list of best drum kits, it’s a peach of a kit. The all maple construction really gives it that Gretsch sound. The snare is very versatile and the toms are pitched at great levels. It’s gonna be a difficult choice between the two as they are pretty much neck a neck. I’m just going to keep bashing away till one of them noses ahead.